Paul grew up in Leicestershire, Lincolnshire and Cambridgeshire. He worked for British Rail as a signalman and BT as an engineer before emigrating to Johannesburg South Africa in 1985. His career before full-time ministry was mostly in telecommunications and information technology. As a hobby he was a reservist constable in the South African Police from 1990 to 1994 and from then a reservist firefighter & emergency medical technician with Johannesburg Emergency Services. He began studying for the ministry in 1994 at the Rhema Bible Training Centre and then completed a BTh degree at the Baptist Theological College in 1998. During his studies he became a volunteer Chaplain to Johannesburg Emergency Services working with both staff and victims. He was ordained Deacon in 2002 and Priest in 2003 at Johannesburg Cathedral and served his curacy at St Michael’s, Bryanston in South Africa. 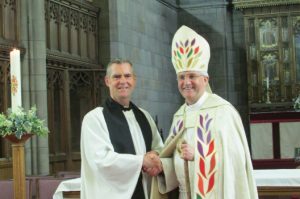 He returned to the UK at the end of 2006 and served as a Team Vicar in Bury St Edmunds and Vicar of East Molesey in Surrey before moving to Clifton and Brighouse in May 2015. 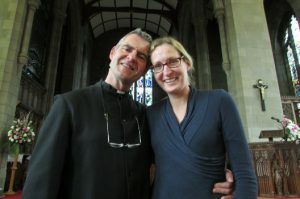 He is married to Agneta who he met at the Taizé Community. She is a nurse specialising in palliative care. She previously worked as a full-time musician in the Church of Sweden. He enjoys reading, running and watching crime and medical dramas.